Cabinet has approved the civil service audit, heralding a new chapter in the public sector through the implementation of measures such as reduction of student teachers and trainees’ allowances, termination of any salaries still paid to teachers at trust and private schools and resuscitation of payment of pension by civil servants. Some of the cocktail of changes, meant to reduce the government wage bill and steer economic growth, are with immediate effect. All vacant posts have been abolished, bus fare for civil servants has been re-introduced, under-used staff is being redeployed, funding of bridging courses has been scrapped while all members who were abusing various types of leave, tampering with pay sheets and attendance registers have been charged. Public Service, Labour and Social Welfare Minister Prisca Mupfumira said the approval by Cabinet would change the face of the civil service. She said civil servants would make 7,5 percent pension contribution to the Public Service Pension and there would be a cut on the allowances student teachers were getting. 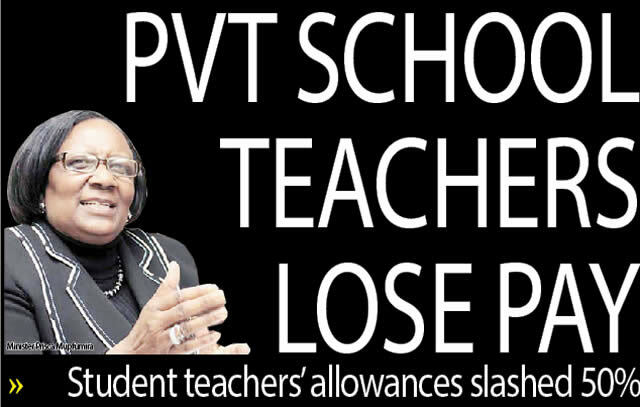 Minister Mupfumira said teachers at private and trust schools, who gobbled $72 million this year in salaries and allowances, would no longer get anything from the government. This comes amid reports that the audit is heading towards other sectors such as Judicial Service Commission, Defence Forces Service Commission, Police Service Commission, Prisons and Correctional Service Commission and the Health Service Board where the Civil Service Commission has no mandate to conduct any stock-taking. This, officials said, will see the government attaining a “comprehensive assessment of the employment costs” as the sectors also draw a sizeable portion of the wage bill. The 2015 civil service audit only covered members governed by the Public Service Act (Chapter16:04) who chew about 29, 9 percent of the budget. She said civil servants using CSC buses were now paying a nominal bus fare as some of them were drawing transport allowances and using the bus at the same time. She said the employment costs for grant aided institutions would be reviewed with effect from 2016 as some of them collected revenue that could sustain their operations. “It was agreed that public service training be centralised. :Ministries were submitting human resources development plans to the PSC which analyses and approves specific courses to address skills gap. “Treasury allocated funds for training without any synchronization with the plans submitted meaning no link between the provision of funds and identification of skills gap. Minister Mupfumira said salaries for foreign service officers were now being paid through the Salaries Service Bureau adding that no civil servant would be sacked. “It is not the number of employees but the dollar value,” she said. All the initiatives the government is taking are in line with the Zim-Asset Public Administration, Governance and Performance Management sub-cluster which is guided by the Results Based Management System which focuses on budgeting and resourcing, public sector modernisation and civil service reform, fostering good governance and building capacities for public sector institutions.